Captain D's is famous for more than just their signature hand battered fish. We also have breaded shrimp, crispy chicken tenders, fresh salads, grilled items, along with a variety of side options and desserts. 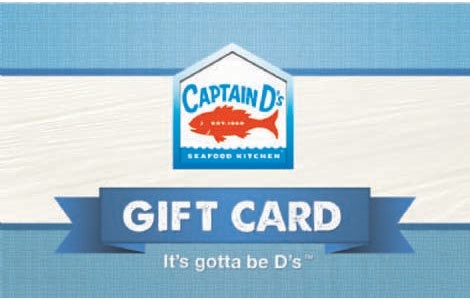 National Gift Card is the best place for you to order Captain D's gift cards in bulk. We are the experts in all things gift cards and can set up your gift card solutions program for you today. Please contact us for more information on bulk, direct-to-recipient, or individual gift card fulfillment for your gift card program. Contact us here or call us at 888-472-8747 today! GUEST SUPPORT INFORMATION FOR BALANCE INQUIRY CALL 1-866-608-5474 OR VISIT WWW.CAPTAINDS.COM. You may redeem this eGift Card for food and beverages at any participating Captain D's location. This card is not redeemable for cash.